Updated VC and 2d panel for Mark Rooks Iris Goshawk Repaints. This will fix many Mark Rook's Goshawke repaints and give them the VC for FSX with working gauges in VC and 2d panel. BAE Systems T-45C Goshawk Package. Original FS2004 Goshawk with panel, VC and config updates by Danny Garnier. T45C Goshawk: Role: Advanced Trainer & Light Attack Aircraft. Includes Custom Panel, Virtual Cockpit, Sounds & Multi Liveries - US Navy, US Marine Corps, Blue Angels, & more. Model by David Brice & David Friswell DSB Design. Panel updated for FSX with compatible gauges and I changed the contact points so the front wheel sits on the runway. Updated for use with FSX by Danny Garnier. This is a Repaint of David Brice & David Friswell's T-45 Goshawk for modified for Microsoft Flight Simulator X.. This Paint Scheme is of The VT-9 MARINES Tiger Paint Scheme number 165088 VT-9 TW-1.This aircraft includes new Flight dynamics and effects and too many animated parts to name and a new Panel. Textures By Mark Rooks of RDG Aircraft pictures of the original Goshawk and BU NO # 165088 history included.. Squadron Motto "We Train Hookers" . This aircraft includes the VC and 2d panel updated by Danny Garnier. "Very dark gray blue" textures, Nr.18 Flottille 11F , for Romain Lucas Super Etendard FSX Version: http://www.simviation.com/simviation/?ID=64&page=30&mark=665 .. FS2004/2 Version: http://www.simviation.com/simviation/static.php?ID=75&page=4 ..
FS2004 / FSX Dassault Mirage III E, Camo paint scheme with virtual cockpit, full package, 5 different weapon loads (including rocket pod, Matra R530 and bombs), by Patrice Grange. The Mirage III is the emblematic French Fighter of the sixties. This one is the Camo version, improved from my previous releases + Virtual Cockpit + animated missile Matra R-530 + 5 different weapon loads. The models has full moving parts and animations (updated control surfaces, gears, spoilers, canopy, pilot ejection, dragchute, animated missile, pilot ladder, guns, ...) + a custom panel + a Virtual Cockpit. By Patrice Grange, December 2009. This is an update for FSX acceleration of the Alphasim Su-47 Berkut. I have updated the flight dynamics, added switches and toggle icons to the panel, removed the spoiler, and changed the afterburner effects. This aircraft has both a 2D and 3D cockpit. This is the whole aircraft. The flight dynamics and the panel will not work in FS 9. This update is only for those who did not download my original update. The only change here is to my own afterburner burners effect from the effect that was in the original update. This is an update for both FS 9 and FSX of the FS 9 Firefox 2 by Owen Smoot, painted by Kurt Beswick. This is my last FS 9 update for it with the following changes: the textures have been changed so they work in FSX as well as FS9, the afterburner effects have been changed. See the read me for how to install in FS9 or FSX. This is the whole aircraft. Aircraft.cfg file and Panel.cfg file to install a new realistic F/A-18 Hornet HUD to Dino Cattaneo's T-45C Goshawk. The HUD has many new features including: 1) Precise ILS and TACAN navigation for aircraft carriers (including moving carriers) that allow carrier landings in low visibility and at night. 2) The HUD symbology is conformal to the outside world: The horizon bar stays on the horizon, velocity vector shows actual flight path as read against the outside world (if you keep your vector pointed at a certain spot on the runway, this is exactly where you will land). 3) Caged mode with ghost vector for use in heavy side wind conditions. A short demo of the T-45C with the new HUD is available here: http://www.youtube.com/watch?v=7Njnw3FwT9s. By Jivko Rusev. 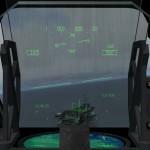 Aircraft.cfg file and Panel.cfg file to install a new realistic F/A-18 Hornet HUD to Dino Cattaneo's F-14D Tomcat. The HUD has many new features including: 1) Precise ILS and TACAN navigation for aircraft carriers (including moving carriers) that allow carrier landings in low visibility and at night. 2) The HUD symbology is conformal to the outside world: The horizon bar stays on the horizon, velocity vector shows actual flight path as read against the outside world (if you keep your vector pointed at a certain spot on the runway, this is exactly where you will land). 3) Caged mode with ghost vector for use in heavy side wind conditions. By Jivko Rusev.